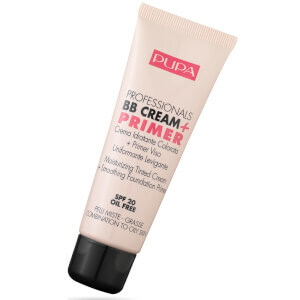 Create a flawless complexion with the PUPA Professionals BB Cream Primer for Combination/Oily Skin. Exclusively developed by the PUPA laboratories, the multi-tasking formula combines the moisturising properties of a BB cream with the perfecting benefits of a primer. A blend of Hyaluronic Acid and Beeswax ensure ultimate hydration and moisture balance, while advanced Silicone Polymers work to create a protective barrier between skin and makeup for longer lasting results. With a natural looking colour pigment coverage and SPF 20, it leaves skin feeling soft, smooth and protected with the appearance of blemishes and imperfections effectively disguised. Can be applied either alone or as a base for make-up.